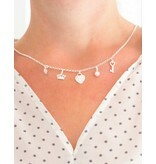 Home / Silver chain "Compose yourself"
Beautiful genuine silver necklace that you can personalize as you wish. 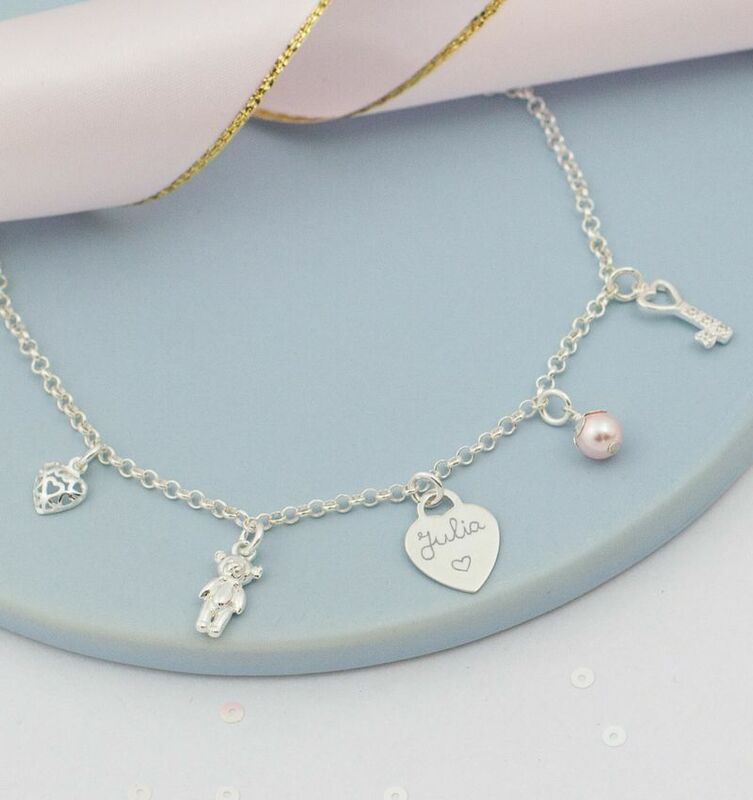 We engrave charms for a personal touch. The charm of old, but in a new jacket! We hang the beads on a beautifully beautiful (and strong!) Jasseron necklace, they do not fall on 1 hoop with a bead chain. Made of first quality silver (.925), forever beautiful. ♥ Door-and-door .925 Sterling silver, highest quality and forever beautiful! 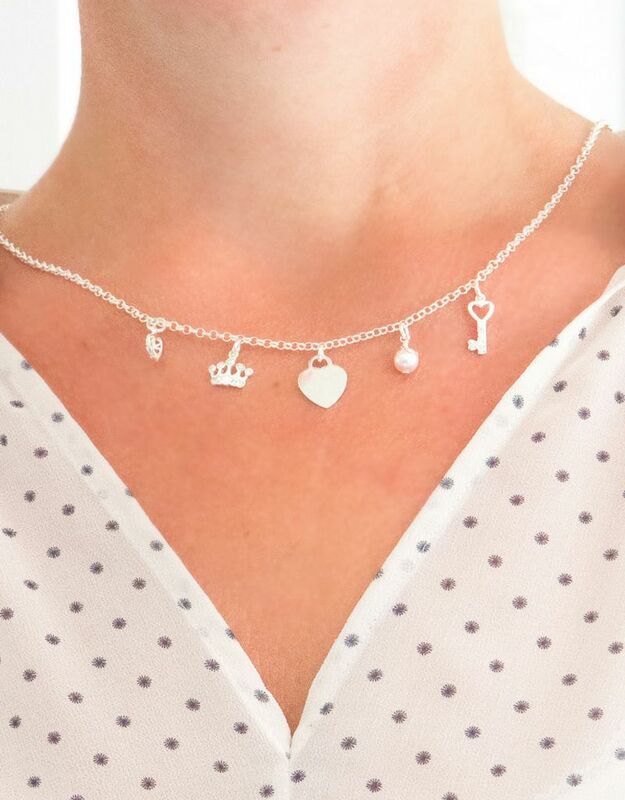 ♥ You choose the charms, we hang them on the chain! ♥ We use a solid jacket necklace with 2mm links. ♥ Children's chain length: 41 cm with an extra eye of 37 cm so that the chain grows evenly. ♥ Women's chain length: 50 cm with an extra eye of 45 cm so you can wear the chain at two heights. ♥ The beads are approximately 7 mm to 1 cm tall. ♥ The begging is handcrafted manually by hand in our studio with a engraving pen. The pen is attached to a high pressure device that allows you to engrave clearly and deeply. The engraving is thus not "machined candle" or stamped, but literally "handwritten" by Tanja. ♥ In addition to symbol charms, we have beautiful Swarovski ® Crystal pearls in more colors. Each pearl is created around a crystal core, giving the pearl a weight that is almost identical to a true pearl. The Swarovski® Pearl-colored coating is resistant to fading and gives a beautiful shine to the pearl, which appears to be inward. These pearls are of the highest quality. ♥ By jewel, KAYA donates an amount so that a child in Gambia can attend school for one week (CSR).